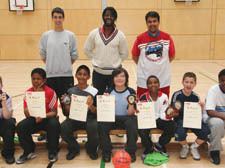 YOUNGSTERS will be given the chance to shine this summer after being invited to sign up for a sporting extravaganza at Haverstock School. Under the guidance of professional coach Joe Allen, stars aged 16 and under can join an action-packed week at the school in Chalk Farm with a host of sports, including football, hockey, cricket and basketball. Part of the extended schools programme, pupils from across the borough turned out in force last time out, where they received certificates for individual excellence and trophies, sponsored by Kajima Community.